I've never been a big gladiator sandal person, mostly because I don't think I could pull them off. I like the idea of the lace up or cutout on the calf but the leather just isn't me. 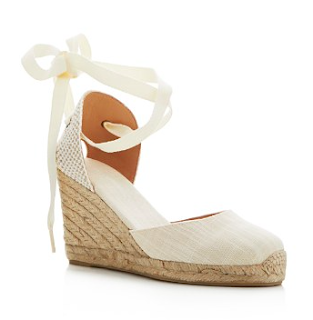 That's why I love the lace up espadrille wedges for summer. I can do the ankle lace in a variety of ways and the wedge makes them a bit dressier than your average sandal. You cannot beat this price. You don't even need a pedicure to wear them. 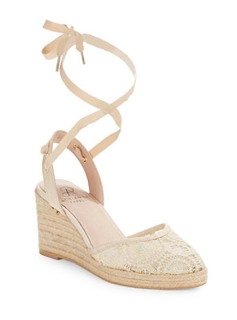 A lovely neutral shoe for all of the sundresses in your closet. 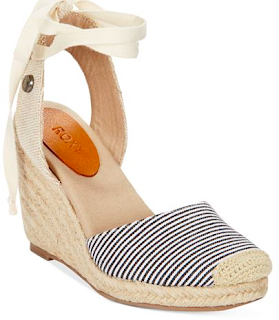 These ballet-like sandals are such a statement in navy. Lovely lace, also comes in pewter. Espadrilles are the quintessential summer shoe, and the lace up detail is just the cherry on top.